Sitting on the banks of River Tay is the historic city of Perth, Scotland, the county town of Perthshire. Perth is the major shopping area for the surrounding highland towns and villages. As any major city, Perth has great places to eat-out, shop and be entertained. Since the publication of Sir Walter Scott’s Fair Maid of Perth in 1828, it has been romantically referred to as The Fair City. Even today, the name is well justified. It has been a consistent winner of the Beautiful Britain Award. Its city streets and gardens are beautifully well kept and it looks glorious from spring to autumn. Perth history dates back to 4000 BC. Records show that Mesolithic men arrived in the area over 8,000 years ago. In 12th century, Perth was given the Royal Burgh status by King William the Lion. The town was one of the country’s richest burghs and traded French wine and Spanish silk with France, the Baltics and the Low Countries (modern day Belgium, Netherlands, Luxemburg and West Germany). Perth offers tourist of all ages a wide range of activities and local attractions. The historic Huntingtower Castle is located in the area. It was the scene of the Raid of Ruthven, when the boy-king James VI was kidnapped by the Protestant lords. Locals believe that the castle is haunted. Some people had reported seeing a tall lady in green silk dress walking around Huntingtower, thus the name ‘Lady Greensleeves’. It is believed that seeing her is a bad omen. In the 1930s, a traveller had reported seeing her in the castle corridor, the next day he fell from the ferry while crossing the River Tay on his way to Fife. Another historic attraction is the Scone Palace. This is the Earls of Mansfield’s ancestral home and the place where Scottish Kings were crowned. Perth is the communications centre for this part of Tayside and long referred to as the 'Gateway to the Highlands' although the hills are still a fair drive on. The 'Fair City' as it is also dubbed, with its tall spires and shallow River Tay flowing through it, is surrounded by two wide parklands. The North Inch, the site of the famous Battle of the Clans in 1396, is played over by a municipal golf course next to the Bells Sports Centre while the South Inch holds various facilities for bowling, boating and field games. Perth is home to two Historic Scotland properties, namely Huntingtower Castle and Elcho Castle. 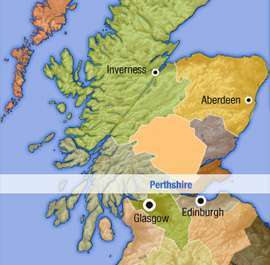 Perth is also famous for its Inches, the South Inch and North Inch. These are large grass parks found on the western side of the River Tay and joined by Tay Street. This is a common place for snowball fights in winter and picnics in the summer months. Perth Art Gallery and Museum presents exhibitions that illustrate the development of local industry particularly whisky, which remains very important to the area along with the insurance industry. Silverware is also on display fashioned by the county's craftsmen of three centuries and there are good depictions of Perth's local history. The Fair Maid's House situated behind Charlotte Street in North Port was the home of Sir Walter Scott's heroine, Catherine Glover and is one of the oldest houses in Perth. It contains a well-stocked and popular craft and gift shop. Perth Leisure Pool, just off the Glasgow Road, is Scotland's most advanced water-works complete with flumes, wild-water rides, and outdoor lagoon and bubble beds. There is also a good diner & bistro. Further west is Bell's Cherrybank Gardens just off the A9 on the Glasgow Road and part of the whisky distiller, Arthur Bell's head office. It incorporates the Bell's National Heather Collection along with a bright, pleasant cafe. With its beautiful gardens, walking around Perth is a delight. One of the best trails to follow is the William Soutar Perth Walks. It is a wonderful gentle walk that will take you to some of Perth’s literary landmark immortalised by William Soutar, Perth’s most famous poet. You don’t need to head for the hills to appreciate nature in Perth, just head to Branklyn Garden and the Bell’s Cherrybank Centre. Branklyn Garden has an extensive collection of unusual and rare plants while the Bell’s Cherrybank Centre has the largest collection of heathers in Europe. Accommodation is very easy to find in the city. Perth hotels cater for both tourist and business travellers. Situated between two public parks - North Inch and South Inch - and with the river Tay passing gracefully through the centre, Perth is a beautiful city to visit.